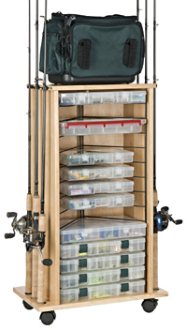 Made of wood and wire, this rolling cabinet holds up to 12 rods and 14 utility boxes. Sliding rubber clips secure rod tips with perfect alignment. Wheels are included for easy movement.